Are your clinicians ready for less alarm fatigue and more efficient workflows? Vocera Engage can help you manage clinical alarms and alerts in coordination with Vocera Platform Interoperability and the Vocera Collaboration Suite mobile app. Engage works behind the scenes to aggregate patient and care team information and deliver it to caregivers on their mobile devices in parallel with secure messaging and event notifications. Based upon protocols set by your team, built-in workflow intelligence prioritizes alarms and notifications. The system sends only actionable notifications, accompanied by information about the patient, caregiver, and event, to the appropriate recipients. 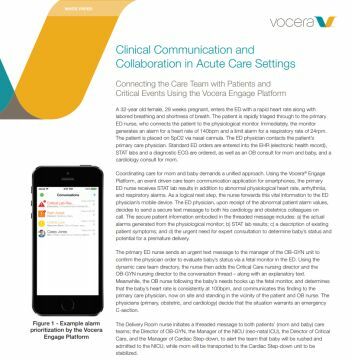 Enable real-time situational awareness and patient-centric communications: Engage can aggregate patient and care team information and provide it in parallel with secure messaging in Vocera Collaboration Suite. Help reduce interruption fatigue: Engage can use multiple variables to trigger actionable alarm and alert notifications and filter out non-actionable notifications. Inform clinical decision making: Engage allows data to be unified from multiple sources at one time including EHRs, clinical and operational systems, and medical devices. Allow faster response to clinical events: Engage integrates with location technologies to identify which care team members are and are not available to respond. Scale to support the enterprise: Support the needs of your hospital today and scale for the needs of tomorrow across an entire integrated delivery network.